The Harlow-Hardy Co. Inc., a furniture store, opened in 1917 at 134 W. Bank St. in Petersburg, Va. President was George David Harlow (1874-1946). Secretary was Clifford William Hardy (1888-1977). Treasurer was Edlow Sims Harlow (1882-1964). The following obituary notice from a weekly called the New Journal and Guide, Norfolk, Va., 5 Oct. 1946, stressed George D. Harlow's gifts to "colored" churches, "Petersburg - George D. Harlow, prominent businessman whose family has long been known for its liberal attitude toward colored people, died here Sept. 8, leaving a huge estate, part of which was bequeathed to local colored churches and citizens. Funeral services were held at High Street Methodist Church, of which Mr. Harlow was a member, and to which he also left a grant. A fomer vice-mayor of Petersburg, and a partner of the Harlow-Hardy Furniture Company, Mr. Harlow was also prominent in church and civic activities. His estate, valued at $3,000,000, left $250,000 to each of 8 of the city's colored churches. Other bequests ranging from $100 to $500 went to the company's 7 colored employees. Immediate surviving relatives are: William D. Harlow, Robert V. Harlow, Edlow S. Harlow, brothers; Mrs. Janie Bennett, sister; and Miss Virginia Rose Hatchett, step-daughter, all of whom were left equal portions of the bulk of the estate." Harlow-Hardy grew directly out of a predecessor company, Harlow, Willcox & Co. George D. Harlow was secretary-treasurer at Harlow, Willcox & Co. Inc. from 1909 to 1916. Clifford W. Hardy was a salesman at Harlow, Willcox. Edlow S. Harlow had been shipping clerk. Harlow, Willcox was listed in Petersburg city directories from 1909 to 1935. The last Willcox associated with the company was William Howard Willcox (1876-1933). William H. Willcox was a founding member of Harlow, Willcox, and died 16 Feb. 1933, age 56. Harlow, Willcox & Co. was itself preceded by the firm of Harlow, Bailey & Co.. They were listed in Petersburg city directories in 1905 and 1907. George D. Harlow was an officer. Also included was Norwood P. Bailey. Norwood Price Bailey (1875-1959) seems to have lived most of his life in Richmond, Va., as a furniture salesman. He registered for the World War I draft in 1918 when employed at Jones Bros., 1418 E. Main St., Richmond. Prior to Harlow, Bailey, two of the Harlow brothers, George D. Harlow and Robert V. Harlow, were in busienss as Harlow Bros. at 124 South Avenue in 1903. Virginia Rose Hatchett (1897-1987), mentioned in George D. Harlow's obituary, was listed as an officer at Harlow-Hardy over the period 1924 to 1943. She was George D. Harlow's step-daughter, and in 1954 she married George H. Collier. George Harwood Collier (1906-1984) was an officer at Harlow-Hardy beginning around 1933. He was preceded in the business by his father, David Marvin Collier (1875-1923). David M. Collier was employed at Harlow, Bailey & Co. (1907), Harlow, Willcox & Co. (1909-1916), and then Harlow-Hardy (1917-1923). By 1927 the Harlow-Hardy business moved to 5 South Sycamore St. By this time Clifford Hardy has left the firm, and Robert V. Harlow was assistant secretary-treasurer. Robert V. Harlow was Robert Virgil Harlow (1879-1951). He was George D. Harlow's brother. Around this time Harlow-Hardy expanded their business to include both furniture and other household goods. By 1931 they moved to 17-19 West Washington St. The building pictured above is 9 South Market St. According to a post on http://www.progress-index.com 9 S. Market dates from 1912 and was used by H. P. Harrison Co., confectioners, until bought by Harlow-Hardy in the 1950s. A photograph of the front facade of his building is found on flickr. The sign points to the retail store on West Washington between Sycamore and Union St. www.emporis.com describes 17-19 West Washington Street as a 6-story low-rise building with a steel frame and brick facade, and names it the Harlow-Hardy Furniture Store Building. The business survived at 17-19 W. Washington St. until at least 1977, witness this ad from the Progress-Index, August, 1977. A photograph of the Harlow-Hardy building at 17-19 W. Washington is found on flicker, uploaded 2006. Another is found on flicker, uploaded 2016. A rear entrance sign is also found on flicker. 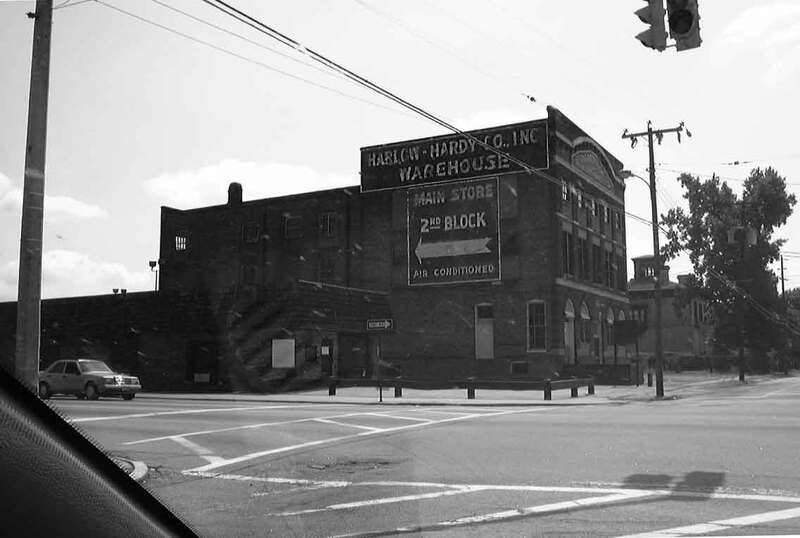 Also related to Harlow-Hardy was the Petersburg Furniture Co., who were in business (supposedly) from 1877 to 1963. William H. Willcox, treasurer at Harlow, Willcox & Co. in the late 1900s and early 1910s, was also secretary-treasurer of the Petersburg Furniture Co. in 1897. His partner and president in 1897 was Alexander Jefferson Winfield (1862-1933). This ad for the Petersburg Furniture Co. appeared in The Roanoke News, Weldon, N. C., Thursday, 10 Sept. 1903. A. J. Winfield was President and Manager. This clip from an ad for the Petersburg Furniture Co. dates from 1953. The claim is "established 1887." R. P. Winfield, Sec-Treas was Robert Powhatan Winfield (1894-1972) and Oscar Winfield, Pres was Oscar Lee Winfield (1892-1986). They were sons of the founder, Alex J. Winfield. The date 1887 might refer back to a successor to the company, Hall & Willcox, who were not furniture dealers, but agents for boots, shoes and hats, located at 142 N. Sycamore St. in Hill's Petersburg Directory of 1886-87. The Willcox in this company was John Thomas Willcox (1845-1916). John T. Willcox was the father of William H. Willcox. Hall & Willcox were described as follows in Pollock's Historical and Industrial Guide to Petersburg, Virginia (1884), "Deal extensively in Boots, Shoes, Hats, Caps, Trunks, etc. Their goods are all excellent in quality and moderate in price. The business was established more than ten years ago, and has always held a prominent position. The senior partner, Mr. George W. Hall, holds a responsible office in the City Government - that of Commissioner of Revenue." This ad for Hall & Willcox appeared in Pollock's Guide. On Oscar Winfield's 75th birthday, the following appeared in the Petersburg Progress-Index, 9 Nov. 1967, pg. 17, summarizing his life, "Oscar L. Winfield celebrated his 75 birthday Tuesday while at work. At the same time, it also marked the celebration of working for 62 years at one location. Winfield said he began working for his father when he was only eight years old in the old location of the Petersburg Furniture Company on the lower end of Sycamore St. In 1905, his father moved the store's location to 100 N. Sycamore St. In 1963 the store was changed to Butterworth Furniture Co. In 1905 this was the only retail store on that side of the Rucker-Rosenstock, Winfield added. In his 62 years of working in the present location Winfield has missed only three months for illness. He lives at 223 Franklin St., Petersburg, with his wife Myrtle. He has one daughter, Mrs. Louise W. Augestine, and two brothers Robert P. and Gordon T. Winfield, all residents of Petersburg. He also has two sisters."